They were skinny. I could see the bones protruding from one of their rumps while the rest looked a bit more filled out. But then every horse (or dog or cow or cat for that matter) I’d seen so far had been either slim but normal, skinny or really skinny. I continued with my assessment, eyeing their coats and looking for signs of open sores or mistreatment. Overall, these horses looked to be among the healthier and well fed than others I’d seen. 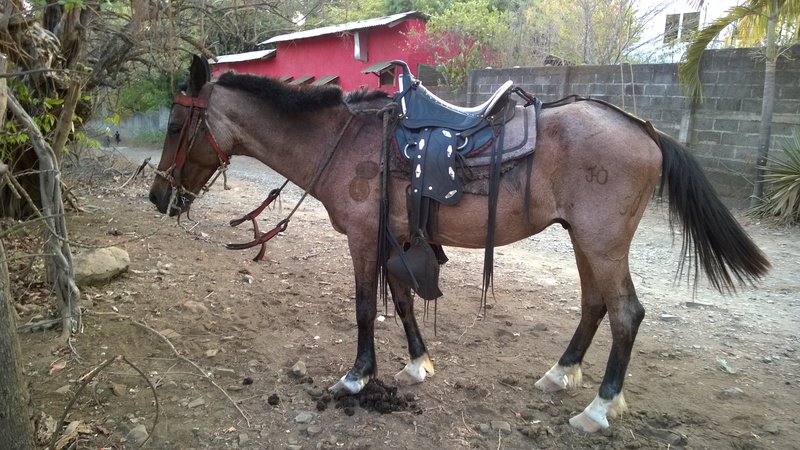 I was struggling with an internal battle of whether or not to go on a horseback riding tour while in Nicaragua. 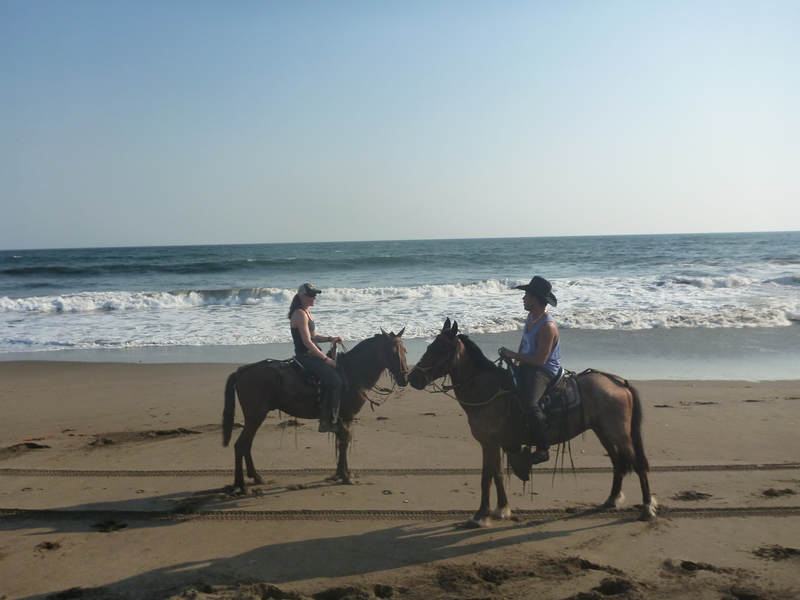 As an avid horseback rider back home in Canada, I enjoy going on horseback riding tours when I travel. It’s a great way to see the countryside and fuels my passion for the equine. I’d been in Nicaragua for 2 weeks now and was staying at a surf camp on the Pacific coast for a few days. One of the daily activities offered was horseback riding. I’d always wanted to ride a horse along a tropical beach and now was my chance. 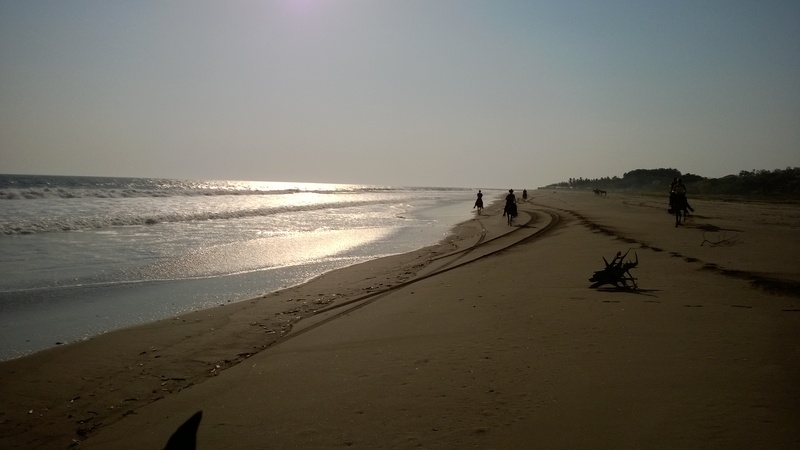 The sun, the surf, the ocean breeze whipping through my hair as I cantered along a beautiful stretch of sandy beach, had long been on my bucket list and this was my chance to fulfill that dream. But I was willing to pass if the horses appeared to be in poor health or mistreated, as I always tell myself when going through a tour operator that uses animals. I didn’t want to be one of the oblivious tourists who would sacrifice animal welfare and support the mistreatment of animals just to have the picture perfect ride along a deserted stretch of beach. I didn’t want my tourist’s dollars going into the same hands that abuse or disregard animal welfare. However, I would support a local riding operation that would consider the horse’s needs and well-being, and understand that if they take care of their animals, they will get more tourists doing tours and thus it was in their best interest to treat their animals well and keep them healthy and happy. So far in my travels through Nicaragua, I’d come to realize that it’s a very poor country. According to the World Bank, Nicaragua is the poorest nation in the region after only Haiti. This was one of the reasons I was traveling there in the first place. I’d arrived 2 weeks earlier with 8 co-workers to volunteer, and teach a First Responders course to locals. They have little to no emergency health care services and I was glad that I had the opportunity to potentially make a difference in their lives and the lives of the people in their community. But here in lies the dilemma: in a country that is struggling to meet the health care needs of their people, how are they expected to meet the health care needs of their animals? Horses and cows in their country are used for work. They are beasts of burden, act as a means of transportation of people and goods and also help with farm work. There were no posh horse stables where people take riding lessons like the ones I was used to back home. Back home, horses are pets that are pampered and dotted over and used for competitions (and yes, some are still used for work purposes). In Nicaragua, they pull carts so that farmers can get their goods to the market. They pull carriages to take the family from location to location. They aren’t simply a hobby for equine enthusiast like me. While I’d been trying to come to terms with this during the course of my travels (it’s always heart wrenching to look into the field and see skinny looking cattle and horses foraging for food in the dust covered fields), now was my moment to make my decision. I spoke with my friend about it and she agreed that these horses were among the better looking ones we’d seen so far. They had shiny coats and life in their eyes. Yes, some were skinnier than I would have liked and maybe their tack didn’t fit the best but their owner was making an effort. I mounted my horse still wondering if I’d made the right decision. We proceeded down to the beach and my little mare was full of energy wanting to go for a gallop. Our guide asked if we wanted to canter and we took off. My horse seemed to love the freedom to just go and rip down the beach! I enjoyed it but made sure she didn’t run for too long as it was pretty hot out, even though it was late afternoon. I rode my best trying to give this horse a good ride too, one she was probably used to having people bounce around on her back. I stayed light in the saddle and on her mouth and she listened well. Soon we left the beach and headed onto a forest trail that eventually led us into a small fishing village. And that’s when I stopped worrying about whether or not I made the right decision to ride. This was a very poor village. There were shacks in among the banana and palm trees, ones that reminded me of forts my brothers and I used to make in the forest behind our house as kids. Only difference was, these we’re play forts, they were homes to families (sometimes more than one family). All were made up of one room and some had pieces of plywood or tin sheets for walls and aluminum siding for roofs. Some of the “nicer” houses were made of mud bricks or cement blocks. It was dusty and dry (end of the dry season) with barnyard animals running free around the yard while women cooked on outdoor stoves or washed dishes by hands in outdoor basins. This was a community who took their laundry to the local stream to clean and to do their bathing. As we made our way through the village I saw dirt covered children emerge from their one room houses to say hi and chase away the barking dogs that were intent on threatening any trespassers. Hammocks were slung on outdoor patios and I was certain that they were the only beds these families had. During our ride through the village we stopped at home of the owner of the horses to say hi. His house was also a mini store front, selling chips and bottles of pop. He gave each of us a bottle of water and a bag of fried plantain chips (my favorite!) to munch on. His house was definitely one of the “nicer” houses and his family was very warm and welcoming. By the time we were heading down the road back to my luxurious surf camp, my attitude had changed. While I always try to keep an open mind when I travel, I found that in this case I had been a bit prejudice in my western ways. I was imposing my western standards on what was clearly a 3rd world nation and very poor community. Who was I to tell these people that they need to purchase hay and grain so their animals can eat more, groom them and get nicer and better fitting tack? Some of these people are literally trying to survive themselves, trying to put food on the table for their families and wondering where the next meal is coming from. In the end I was happy to support the local farmer who rents out his horses to tourists. He clearly was making an effort to take care of them and keep them as healthy as this dried up, desolate environment would allow. The horses were well behaved, looked healthy (shiny coats, no open sores) and still full of energy as opposed to some of the poor skeletal beasts I would see pulling carts through the streets of Leon with that dead look in their eyes. I was humbled once again by travel and reminded myself that I must not judge the country I’m visiting, as I have no idea what their lives are about. My western standards should be checked at the airport and left for the western world.